Well, it’s been a month since we were matched with our little lady, and to be honest, it’s still sinking in that in a few short months we’ll be parents to a 1-year-old girl! 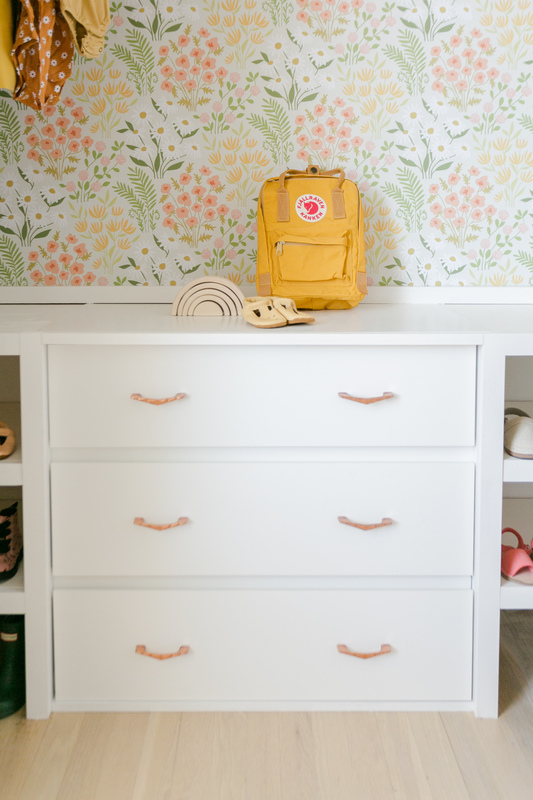 This room is a combination of what we have loved and used in Nova’s nursery, a few hand-me-downs, and a couple new pieces. The result is pretty simple and, most importantly, a room I cannot wait to live a new chapter of our lives in! 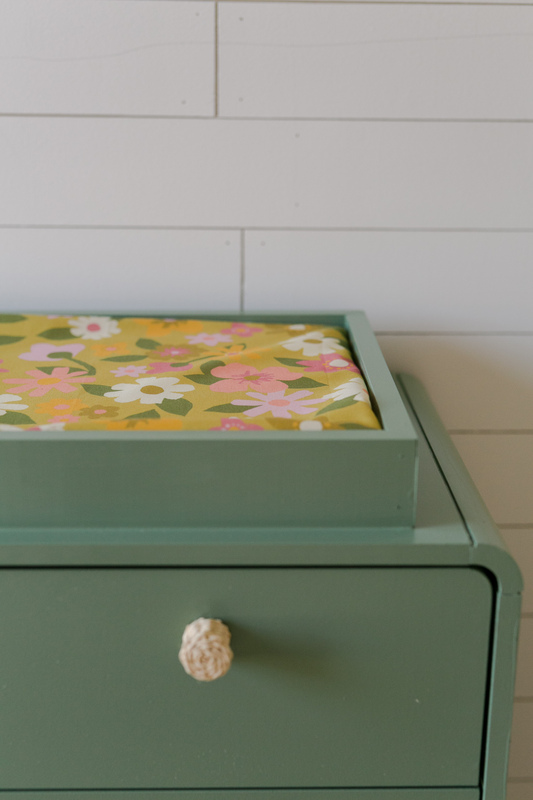 For several months, I checked vintage shops, flea markets and Craigslist for a vintage dresser. I didn’t end up finding one because the size we needed was pretty small, and maybe just a little too specific. So I ordered this dresser and painted it (the color is Privilege Green by Sherwin Williams) and I added wicker knobs, which I found on eBay. Collin did the shiplap on two walls, which made the room feel instantly cozy! I absolutely love it! The hanging chair is from our first home—this is the third room we’ve used it in and it’s still going strong. The floral fabric is from our new collection (LINK?) and I was so excited to see how authentically vintage it looks. I hand-painted all the shapes myself and our designer Mara worked her magic on them. Hopefully I can squeeze in a few more fabric projects for Marigold before our wait to travel is over. 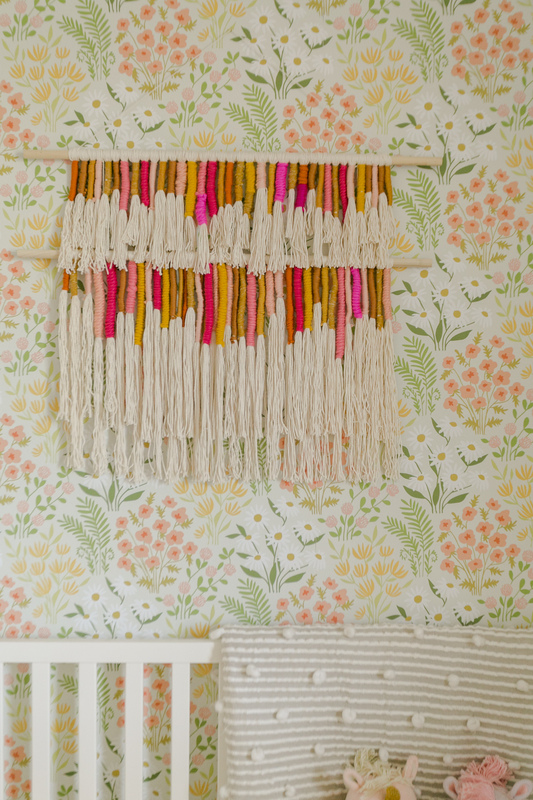 The first gift we received for Marigold was this amazing weaving from Rachel. 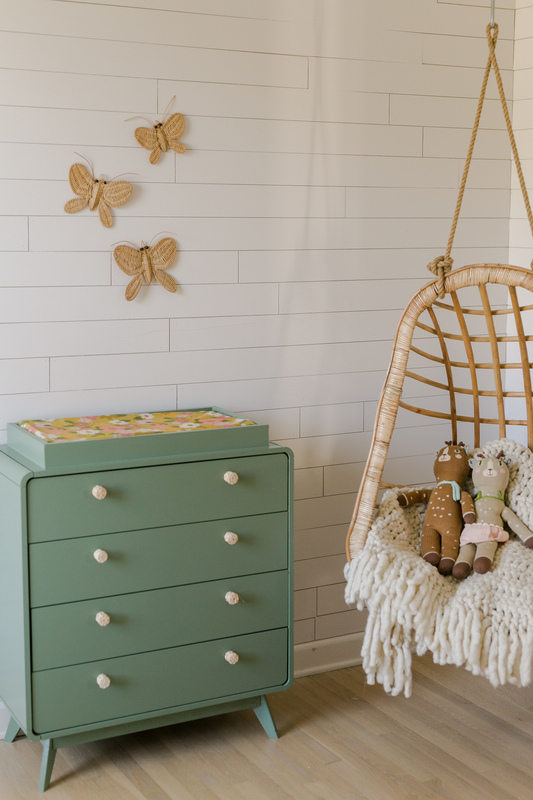 The tiered basket is from Xinh and Co (one of my favorite Nashville brands!). Just like when we were waiting for Nova, I sometimes just wander into this room and look at the tiny shoes and clothes and dream about holding our daughter. I know it will come soon and I’m truly not an emotional wreck (like I was last time), but it’s still not easy to wait months to meet a child you’ve already given your heart to. The little dolls are from Blabla kids and the greatest fluffy throw ever is from CB2. 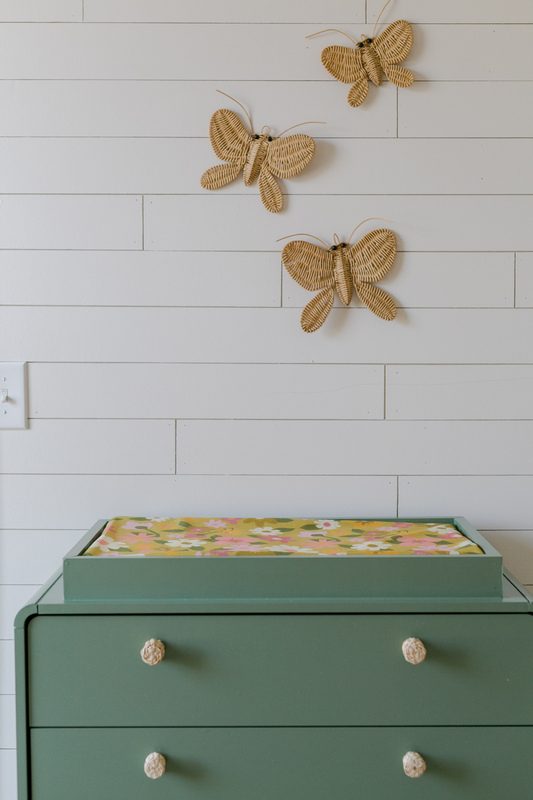 I found these wicker butterflies on eBay and I thought they’d be the perfect way to carry on the theme since I used wicker animals in Nova’s nursery and the kiddo bathroom as well. Moving along, we used stick on wallpaper from Chasing Paper. 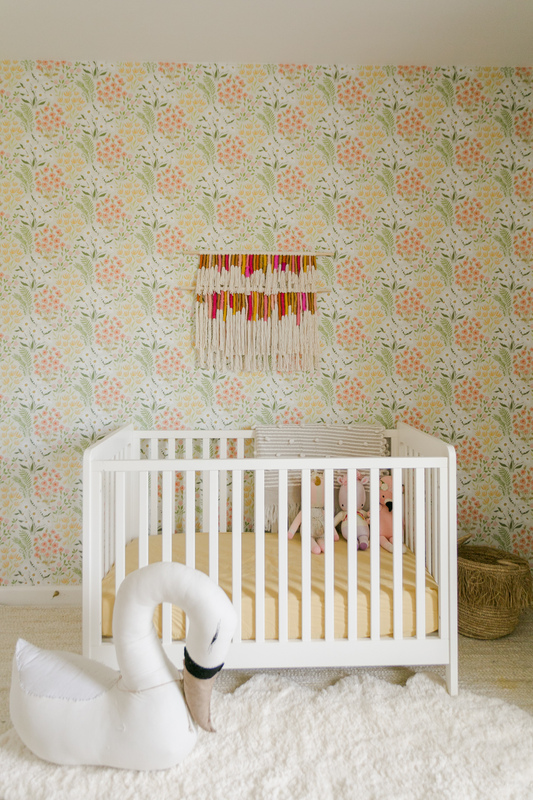 And I was happy we were able to use Nova’s crib (that she never slept in even one time) for little sister’s room. 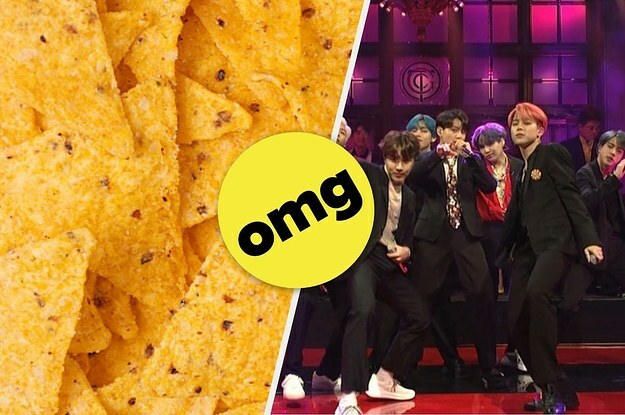 I did my best to do this Honestly WTF DIY. The morning of this shoot I was going everywhere trying to find a cat brush (it’s a part of the DIY, haha) and I never did find one. I may try later, but also I may just leave it like this forever. It was fun to make! 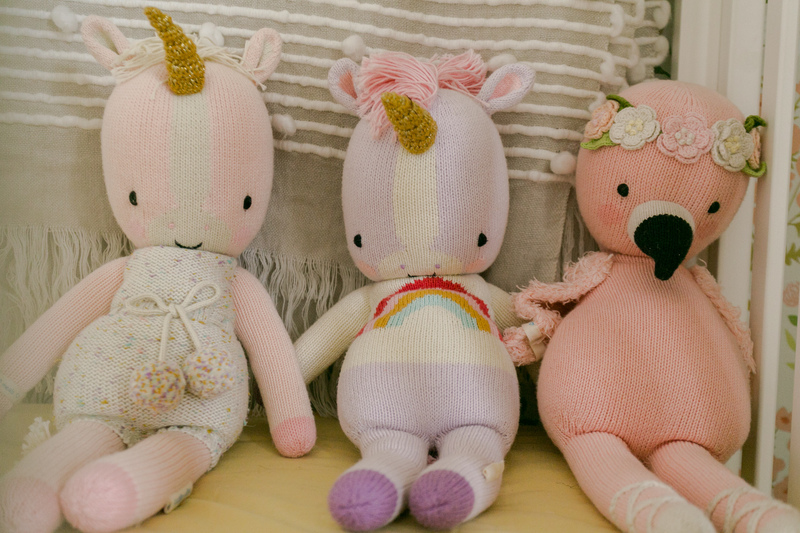 These little cuties are from Cuddle + Kind. I was having a tough time keeping these shelves tidy, so I added all the baskets and it’s been great ever since. 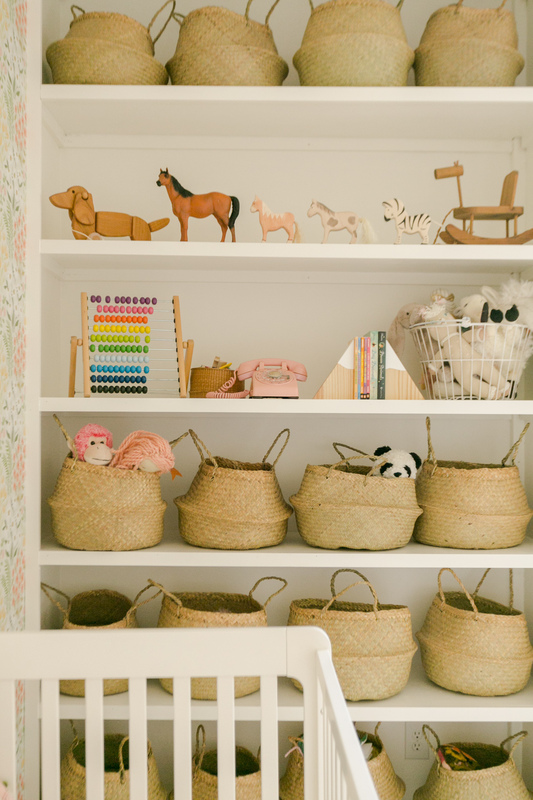 There is a basket for almost every kind of toy (Legos, blocks, dolls, musical toys, etc.). I got these from Xinh and Co as well. 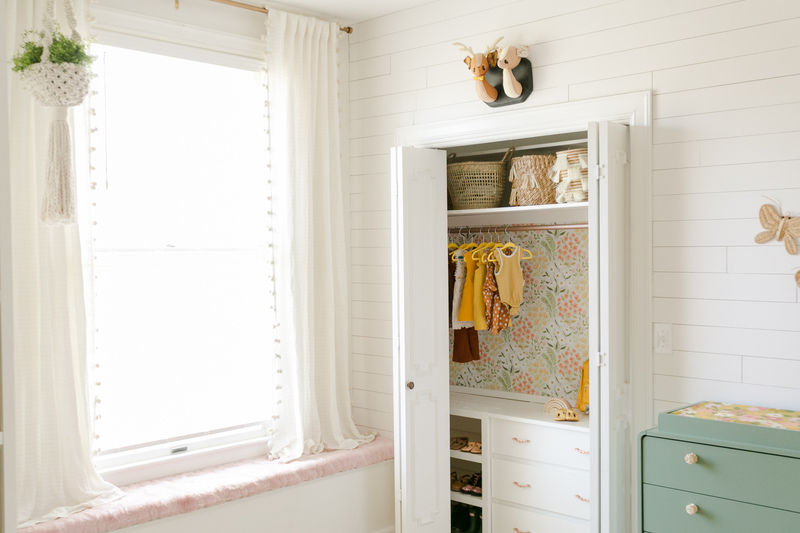 I’ll be sharing a post soon about how we built out the closet. 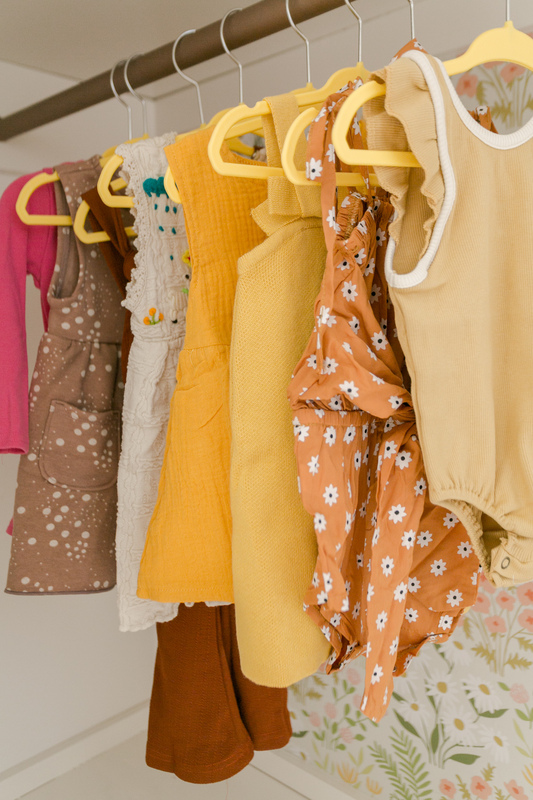 It wasn’t expensive and it makes a HUGE difference in the usefulness of a standard closet for storing children’s clothes. My absolute favorite part of the entire room is this chandelier from Lucent Lightshop. It looks like a daisy from below and is just so incredible! I knew this space needed a soft, cozy rug. It’s SO soft! The adorable swan stuffed animal is from here. Credits//Author: Elsie Larson, Photography: Amber Ulmer. Project Assistant: Collin DuPree. Photos edited with A Color Story Desktop.